The swaying casuarinas trees and the shimmering waters of the seaside resort have made Chandipur a favourite haunt for a small coterie of beach lovers. The uniqueness of Chandipur is that, twice a day its waters recede from the shore a good 5 km away, giving water revelers the ultimate pleasure of walking into its shallow depths with fearless abandon. The beach offers gorgeous views of dynamic seascapes and timeless dawns.Elsewhere, the waves come and go dashing on the shore like madcap but here they are like a musical fountain, soothing to the eyes and ears. Elsewhere, the waters wait for the visitors but here the visitors have to wait for the waters. Elsewhere, the waves go wild and the visitors come but here the ecstasy of visitors will go wild while the waves remain calm. This marvel of Nature gives the bathers and unexpected pleasure of fearlessly walking into the sea and happily playing with the waves. When the water disappears, you can even take jeep ride on the widest beach. The small red crabs further enhance the beauty of theexposed bosom of the beach. If a beachcomber, you will be delighted with its abandon wealth of seashells and driftwood. Balaramgadi Beach: The confluence of the river Budhabalanga with the sea at Balaramgadi, located 2 km from Chandipur, presents visitors a scenic view with fishing and boating. Remuna: Remuna is situated 25 km from Chandipur. Famous for the shrine of Khirachora Gopinath, it is a seat of Vaishnavite culture for centuries. Khira (a special milk preparation) is the most delicious offering of the temple. Champak and Kadamba trees inside the courtyard fill the air with sweet and scented fragrance all the time. Nilagiri: Nilagiri is situated 40 km from Chandipur. Harboring the Kuldiha sanctuary, which is also an ideal base for trekking. Nilagiri is known for the Jagannath Temple. Headquarters of an ex-princely state, set against the green mountain, it is a charming place on the lap of nature. Sajanagarh: Sajanagarh is situated 45 km from Chandipur and about 5 km from Nilagiri. Sajanagarh is famous for the shrine of Bhudara Chandi. A seat of shakti (power) cult, the place is archeologically rich. 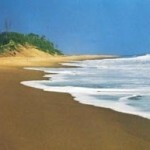 Panchalingeswar: Panchalingeswar is situated 45 km from Chandipur. Ensconced in the verdant of Nilgiri hills with a panoramic views around, it is a place of scenic beauty, sanctified by the five lingams over which runs a perennial stream. Herds of elephants can be seen occasionally moving up and down the Nilgiri hill. It is also an ideal base for trekking the Nilgiri hills. This entry was posted in Chandipur, Orissa, Seabeach and tagged chandipur beach, chandipur map, chandipur sea beach, chandipur tourism, orisa. Bookmark the permalink.